The National Tracing Center assists domestic and international law enforcement agencies by tracing the origin of firearms that have been recovered in criminal investigations. 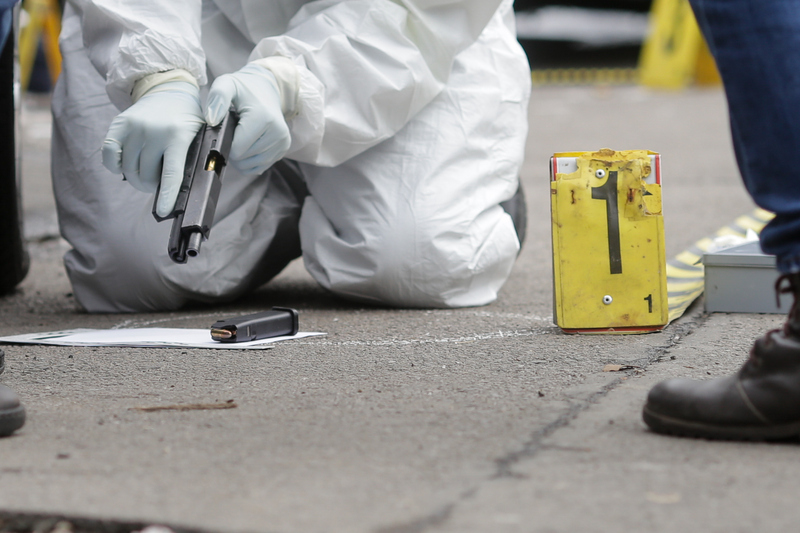 A firearm trace is conducted when a law enforcement agency recovers a firearm at a crime scene and requests information regarding its origin to develop investigative leads. eTrace is a paperless firearms trace request submission system and interactive trace analysis module that facilitates firearms tracing and assists ATF’s efforts to combat firearms trafficking. The Bureau of Alcohol, Tobacco, Firearms and Explosives (ATF) is the federal agency authorized to stem firearms-related violent crime and regulate the firearms industry in America. The ATF National Tracing Center (NTC) assists domestic and international law enforcement agencies by tracing the origin of firearms that have been recovered in criminal investigations. Firearms tracing through eTrace is the systematic tracking of a recovered firearm from its manufacturer or importer and subsequent introduction into the distribution chain (wholesaler/retailer) to an unlicensed purchaser. A firearms trace is conducted when a law enforcement agency recovers a firearm at a crime scene and requests information regarding its origin to develop investigative leads. That information is used to link a suspect to a firearm in a criminal investigation; to identify potential traffickers; and, when sufficient comprehensive tracing is undertaken in a given community, to detect interstate, intrastate and international patterns regarding the sources and types of crime guns. Pursuant to the Gun Control Act (GCA) of 1968, the U.S. attorney general is authorized to administer firearms tracing. The attorney general has delegated ATF the sole federal agency authorized to trace firearms. The NTC is only authorized to trace a firearm for a law enforcement agency involved in a bona fide criminal investigation. ATF eTrace is a paperless firearms trace request submission system and interactive trace analysis module that facilitates firearms tracing and assists ATF efforts to combat firearms trafficking. The eTrace system provides the electronic exchange of crime gun incident data in a web-based environment with a portal to the Firearms Tracing System (FTS) database. The system provides real-time capabilities that allow law enforcement agencies to submit electronic firearms trace requests, monitor the progress of traces, retrieve completed trace results and query firearms trace-related data in the FTS database. In addition, registered users are able to initiate a search of all traces submitted by their law enforcement agency, based on virtually any data field or combination of data elements such as firearm serial numbers, an individual’s name, type of crime, date of recovery or other identifiers. The eTrace system also provides participating law enforcement agencies with the ability to opt-in to a Collective Data Sharing agreement, through which they can share all of their trace data with any other agencies in their state that also opt-in. The end result is a state-level collective data sharing pool through which agencies that have opted-in will be able to access trace data for other participating agencies within their state. The benefits of eTrace include the ability to (1) develop investigative leads; (2) significantly reduce the turnaround time required to process a trace request; (3) improve quality of trace-related information because of real-time data validation; (4) monitor the status of traces; (5) view/print/download completed trace results; and (6) generate statistical reports and perform online analytical research. The eTrace system allows a law enforcement agency to conduct comprehensive traces of recovered crime guns and establish an information platform for developing the best investigative strategies to reduce firearms-related crime and violence. The application is available 24/7 and is provided free of charge to authorized law enforcement agencies. Each participating law enforcement agency must sign a memorandum of understanding with ATF. Distribution of eTrace to the law enforcement community began in January 2005. As of December 2017, over 6,800 law enforcement agencies throughout the U.S. and 45 foreign countries actively use eTrace in their investigative work. The NTC processed over 400,000 trace requests in fiscal year 2017. In December 2009, ATF released eTrace 4.0, the bilingual version of the application, allowing law enforcement agencies to capitalize on the full benefits of eTrace in English or Spanish. The software is an enhancement of the original English-only version and provides Spanish-speaking countries a full language translation capability that increases the ease of use of this pivotal crime fighting tool. In the past, the NTC conducted firearms tracing for foreign governments in a time-consuming, manual process. The 4.0 eTrace software, produced at the request of Spanish-speaking countries, allows users to input and retrieve data in Spanish and, at the same time, enables others to retrieve and search the data in English. It also allows international law enforcement agencies to capitalize on the full benefits of eTrace in Spanish or English and provides data conventions in accordance with international standards. Foreign countries with signed eTrace agreements include Albania, Anguilla, Antigua and Barbuda, Aruba, Australia, the Bahamas, Barbados, Belgium, Belize, Bermuda, Brazil, British Virgin Islands, Canada, Cayman Islands, Colombia, Costa Rica, Curacao, Czech Republic, Dominica, Dominican Republic, El Salvador, Finland, Germany, Grenada, Guatemala, Guyana, Honduras, Jamaica, Japan, Kosovo, Mexico, Montserrat, the Netherlands, Nicaragua, Panama, Paraguay, Philippines, Slovakia, Spain, St. Kitts & Nevis, St. Lucia, St. Vincent and the Grenadines, Suriname, Trinidad and Tobago, and the United Kingdom.